dance.net - New shoes! (Miller and Ben) (9885917) - Read article: Ballet, Jazz, Modern, Hip Hop, Tap, Irish, Disco, Twirling, Cheer: Photos, Chat, Games, Jobs, Events! 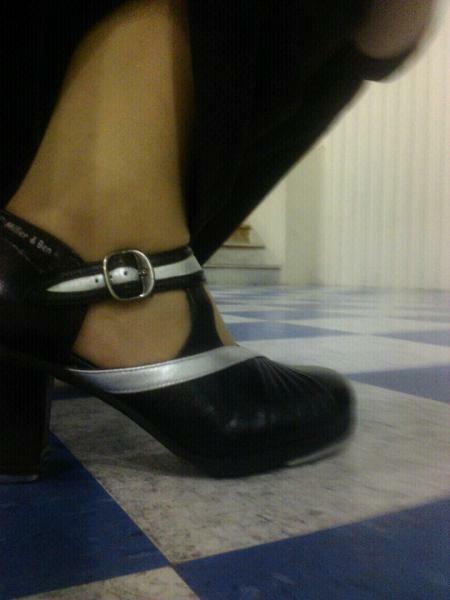 I got my new tap shoes yesterday. I'm so excited and they sound amazing. LOVE! Are those the "New Show Girl" Model. I am planning to get those for my next pair in the bright yellow and gold. Every time I see them I think they look so cheerful. They are actually the "La Coquette." The "New Show Girl" has a lower heel and laces, not a buckle. They are pretty spiffy looking as well. I chose the "La Coquette" because I wanted a buckle. I was very worried that they wouldn't fit. I went through some turmoil picking the size. Ended up getting the 6 1/4. Side note, I showed them to my boss and she was like "you have tiny feet." They are soooo cute. I can't wait to get my custom shoes. I like the design of those they are like tap shoes slash ballroom shoes. They're BEAUTIFUL! I can't wait to be able to afford some of these <3 Are they comfortable? Like any pair of character heels they will take some time to get used to. The day I taught tap for thirty minutes then ballet for an hour then tap for thirty minutes they were fine. They day I taught for two hours but ended up wearing them for three, it started to hurt. But, after a while I am sure they will be just fine. It's just a part of wearing heels. So after a year, how have you liked these shoes?? I still love them. They are much sturdier than other character shoes I've worn. I haven't gotten to tap as much as I would have liked to this past year (hopefully that will change soon!) - but I still love them. The only wonky thing is how the strap to the buckle rubs on my foot.